Description: The Owl Basket is a combination of an owl with a small basket. It's just the right size to hold 4 x 4-inch plant pots. The body and wings are attached to the top of the basket. Should someone ask where his wings are, just point out he is hugging the basket with them! 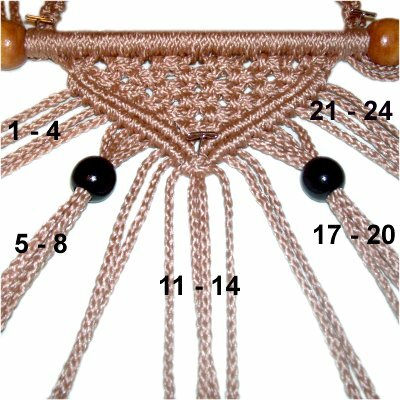 There is a double fringe at the bottom that can be beaded or brushed. 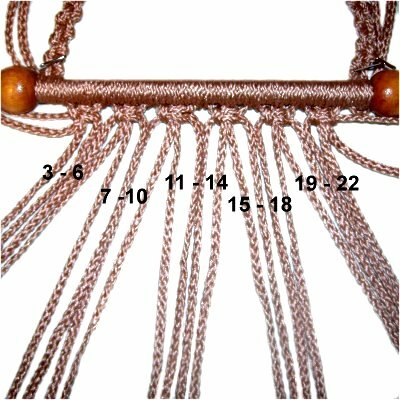 The finished size of this plant hanger depends on the length you make the fringe, but will be approximately 28 inches. 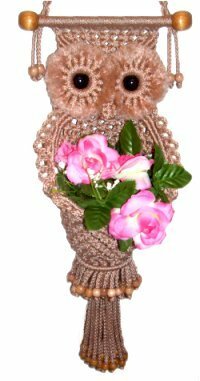 This Macrame Owl pattern is rated Moderate, which means you should have prior experience with the decorative knots used in the design. 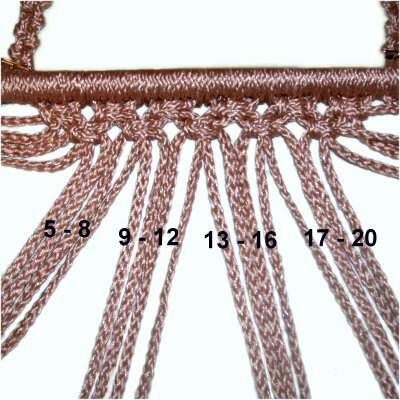 Beaded Fringe: 76 beads, 12mm size with 6mm holes. Step 1: Cut 2 cords, each 3 yards long. Attach both cords to a 1.5-inch ring with Larks Head knots. 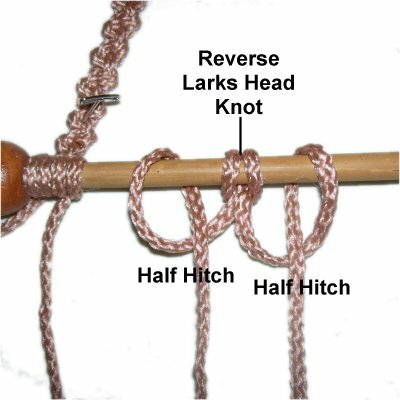 Step 2: To make the hanger for your Owl Basket, tie an 8-inch Alternating Half Hitch sennit with the two halves of one cord, as described below. Then do the same with the other cord. Step 3: Prepare the dowel for your Owl Basket by attaching the 25mm beads at each end. Apply glue if needed. Attach both halves of each cord to the dowel with Double Half Hitches (DHH). Push these knots against the beads. 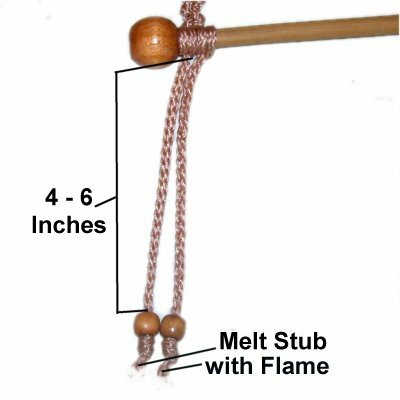 Step 4 (optional): Slide a 12mm bead onto each cord 4 - 6 inches below the dowel. 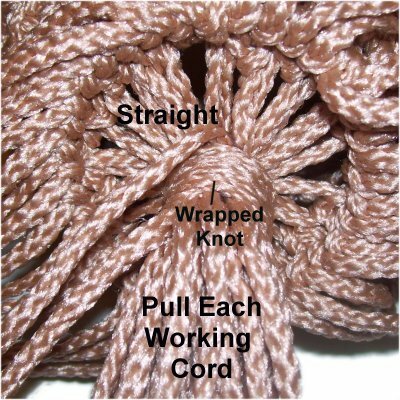 Tie a Barrel knot below the beads, then cut off the excess material. When using Bonnie Braid, leave a 1/8-inch stub, then melt it with a BBQ lighter flame. 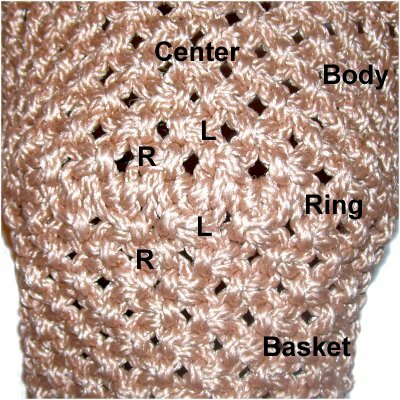 To start the forehead area of your Owl Basket, cut 12 cords, each 4 yards long. Prepare the cords to prevent unraveling. Important: Tighten all the following knots firmly so the rows are close together. Step 5: Mount one cord to the dowel with a REVERSE Larks Head knot. 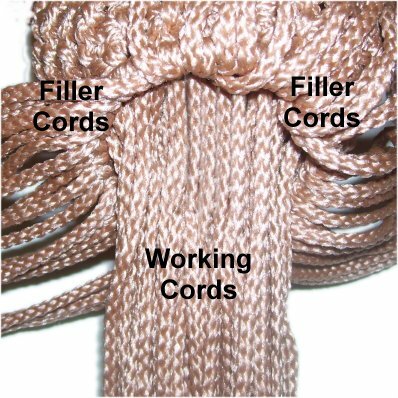 Then add a Half Hitch with each half of the cord. Repeat with the remaining cords. Push the knots close together so they all fit on the dowel. 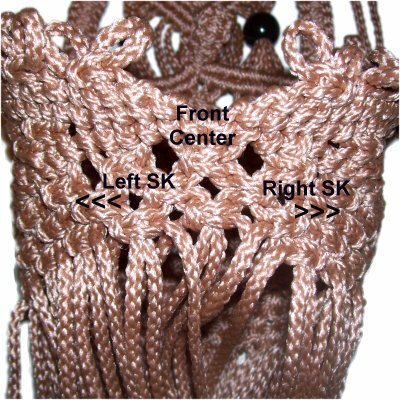 Step 6: The forehead for the Owl Basket is made with 10 rows of ASK, dropping cords to form a V shape. Row 1: Mentally number the cords. Tie ASK with cords 1 - 4, 5 - 8, 9 - 12, 13 - 16, 17 - 20 and 21 - 24. Row 2: Do not use cords 1 - 2 and 23 - 24. Tie ASK with cords 3 - 6, 7 - 10, 11 - 14, 15 - 18, and 19 - 22. Row 3: Do not use cords 1 - 4 or 21 - 24. Tie ASK with 5 - 8, 9 - 12, 13 - 16, and 17 - 20. Row 4: Tie ASK with cords 7 - 10, 11 - 14, and 15 - 18. Row 5: Tie ASK with cords 9 - 12 and 13 - 16. Row 6: Tie the final ASK with cords 11 - 14. Step 7: Place cord 2 against the left diagonal edge of the ASK. It will be a holding cord. Attach cords 3 - 12 to it with DHH, moving left to right. Step 8: Move cord 1 diagonally, next to the previous row of DHH. Attach cords 3 - 12 to it with DHH. Tighten the knots firmly, so the two rows are touching. Move cord 23 down the right side of the V, as the first holding cord. Attach cords 22 - 13 to it with DHH, in that order. 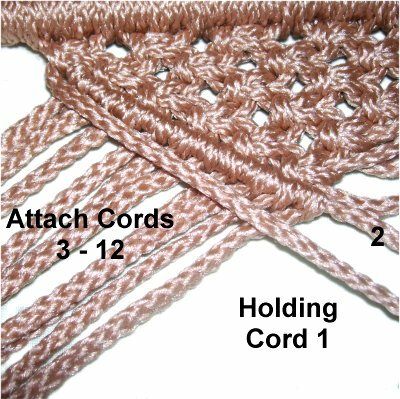 Cord 24 is the holding cord for the second row. Step 10: Tie a Square Knot with holding cords 1 and 24, around cords 2 and 23 (fillers). 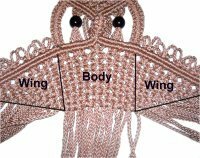 The face for your Owl Basket is very basic, just eyes and beak. There are SK sennits on the outside to make the area more stable. Most of this area will be covered by the eye feathers. Step 11: Mentally re-number the cords. Slide cords 5 - 8 through a black 20mm bead, and cords 17 - 20 through another (one cord at a time). 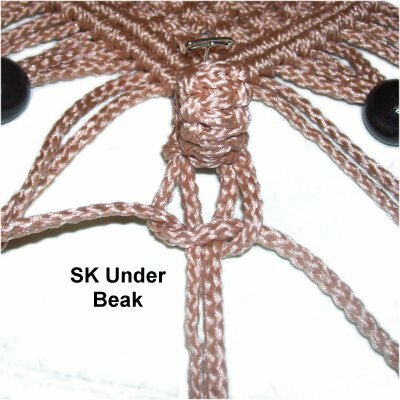 Step 11: To make the beak for your Owl Basket, start by tying two more SK with the cords in the center. They've been re-numbered as cords 11 - 14. Leave a 1/4-inch space, then tie 8 more SK. Step 12: In the space you left are openings to the right and left of the filler cords, which run through the center. 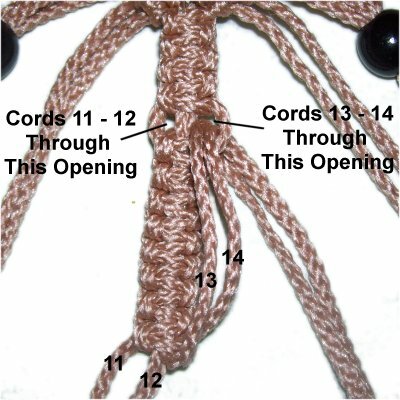 Pass cords 13 -14 through the right opening, and cords 11 - 12 through the left opening. Pull the four cords so the sennit folds backward to form the beak. 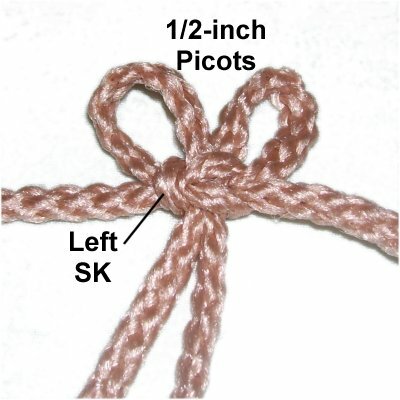 The last knot tied in the sennit should be touching the knots near the space. 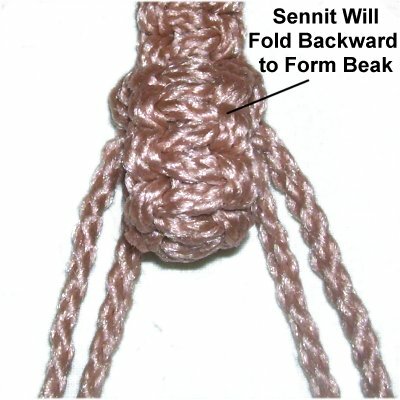 To complete the beak for your Owl Basket, tie a Square Knot with the four cords, so it rests under the folded sennit. 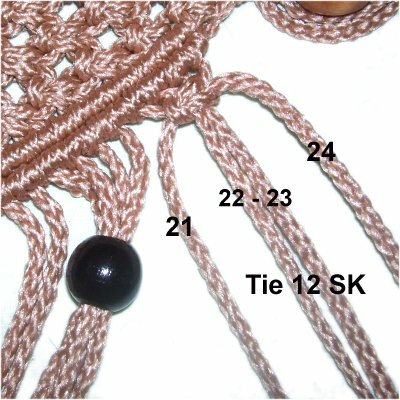 Step 13: Tie 12 SK with cords 21 - 24, on a diagonal slant as shown. 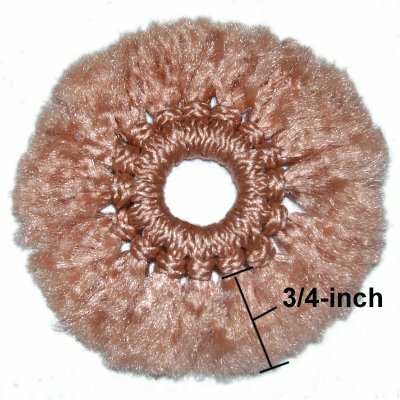 Push the knots close together so the sennit is close to 3 inches. Repeat with cords 1 - 4. Measure it to be sure it's exactly the same length as the first sennit, so the Owl Basket is symmetrical. Step 14: Mentally re-number the cords. Move cord 11 to the left horizontally, and cord 14 to the right, resting on top of the other cords. Step 15: Attach cords 10 - 1 to holding cord 11 with DHH (in that order). Attach cords 15 - 24 to holding cord 14 with DHH. 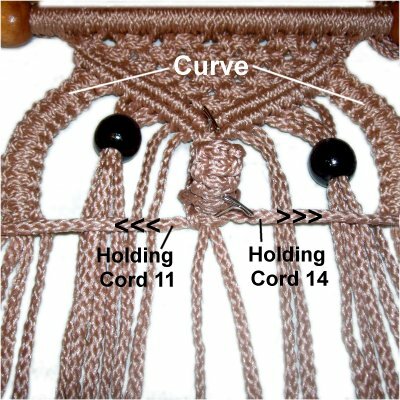 The sennits made with 1 - 4 and 21 - 24 should be curved. The DHH should be close together. Step 16: Move cord 12 left, so it rests below the DHH you just tied. Move cord 13 right. These are the next pair of holding cords. Attach cords 10 - 1 to holding cord 12 with DHH. 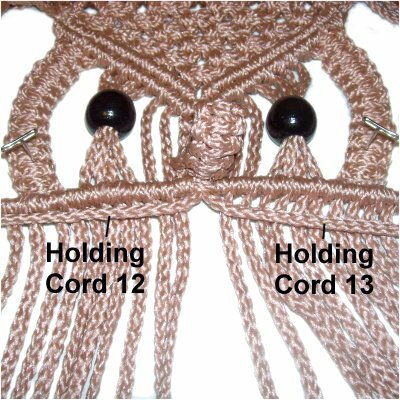 Attach cords 15 - 24 to holding cord 13 with DHH. Step 17: Cut 24 cords, each 2.5 yards long. Prepare the cords to prevent unraveling. 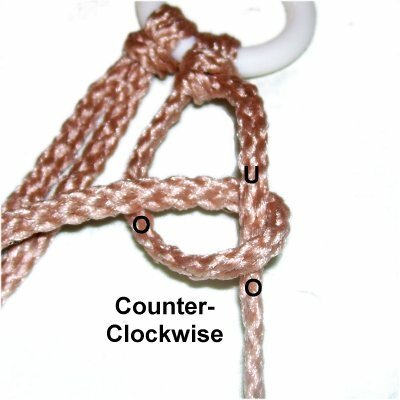 Make sure you know how to tie both RIGHT and LEFT Square Knots. Fold two cords in half and secure them at the center, resting side-by-side. The segments furthest to the left and right are the working cords. The two between them are the fillers. 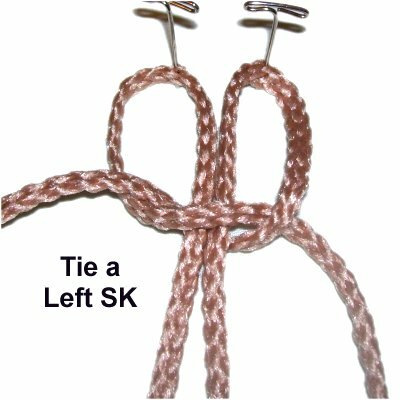 Tie a LEFT SK using the working cords. Tighten it so it rests 1/2-inch below the fold, forming two picots. << Tie 5 more LEFT SK picots, for a total of 6. Make sure each SK is tightened as much as possible. Step 18: Arrange the holding cords from steps 14 - 16 diagonally. 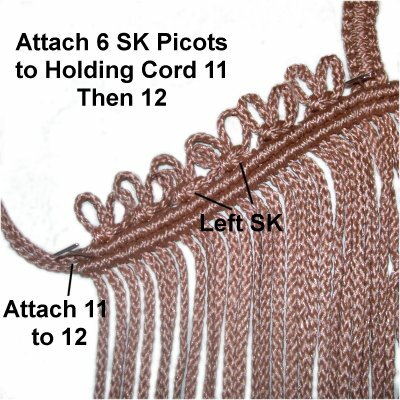 When you attach the picots in the following steps, make sure the SK rest against the holding cords. Attach 6 LEFT SK picots to holding cord 11 with DHH. Then attach them to holding cord 12. 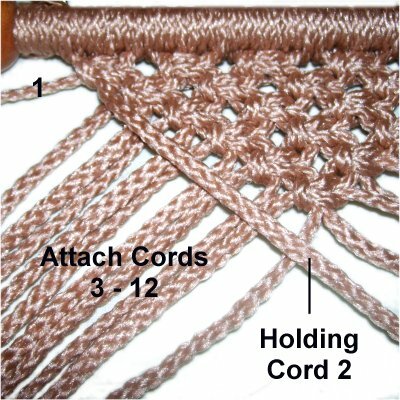 Attach holding cord 11 to holding cord 12. 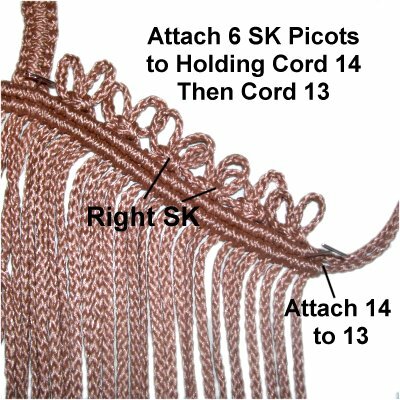 Attach 6 RIGHT SK picots to holding cord 14 with DHH. Then attach them to holding cord 13. Attach holding cord 14 to holding cord 13. Step 19: The body and wings for your Owl Basket are made in one piece. 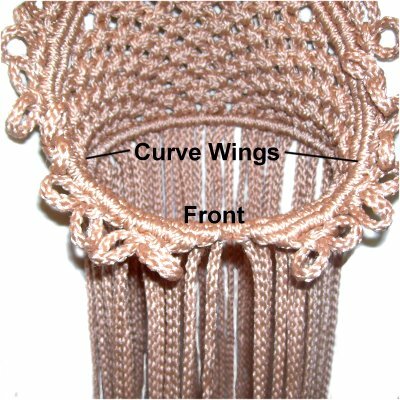 There's a diagonal edge on the bottom of the wings that allows them to fit around the edge of the basket evenly. 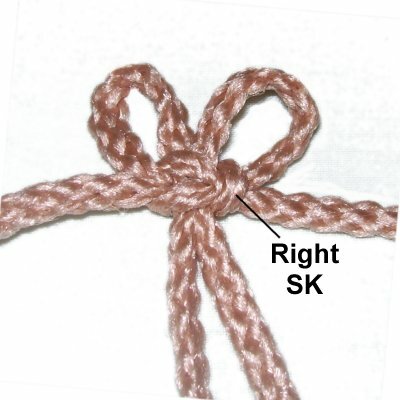 The first and last 6 cords are not used to tie the SK, so push them aside. Mentally number all the cords 1 - 72. 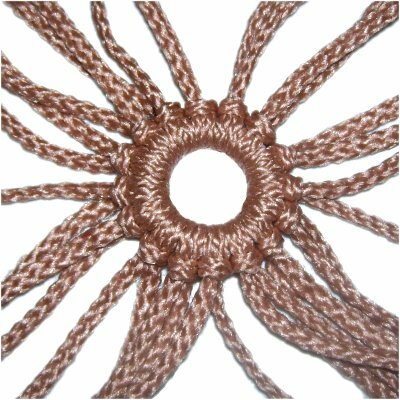 You will start this portion of the Owl Basket by attaching the wing/body design to the ring. The Double Half Hitches are tied so the front of the knots are facing inward, and the wings and body wrap around the outside of the ring. Tip: In the front, it's going to feel like you are making the DHH backward. 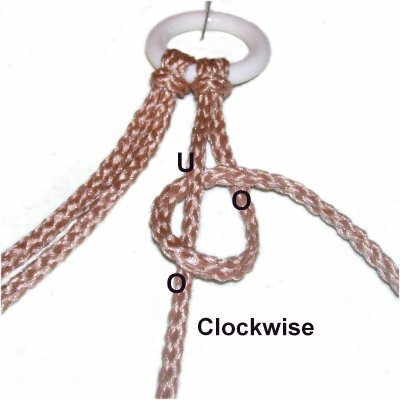 You should reach inside the ring to tie the knots. 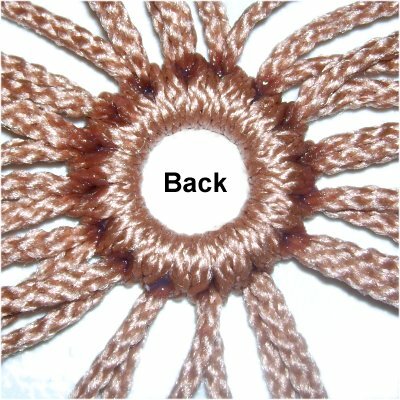 Step 20: Place the 5-inch ring upright, against the 10th row of ASK in the body, so cords 25 - 48 are under the back of it. 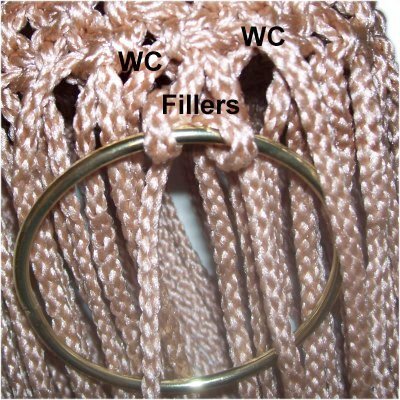 Attach the fillers coming from each SK to the ring with single Half Hitches. 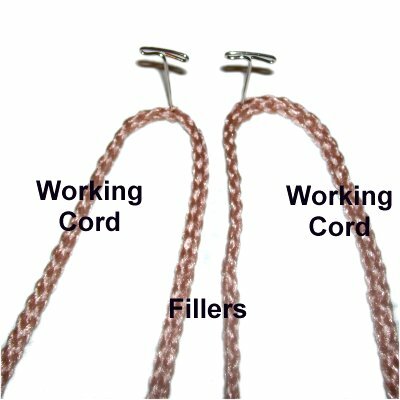 The working cords should be attached with Double Half Hitches. Step 21: Attach the remaining cords with Double Half Hitches, moving from the back towards the front of the ring, on both sides. Curve the wings as you progress. 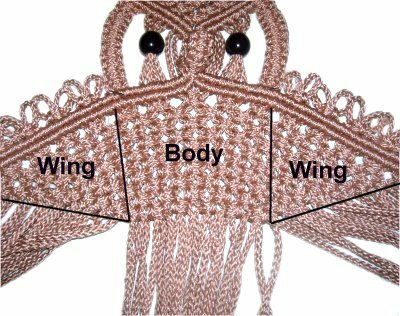 When you get to the cords in the front of the Owl Basket, make sure the rows of DHH in the wings are against the ring (no gaps). Step 22: Now it's time to make the basket for your Owl Basket. The ASK switch from left to right in the back center area, as well as the front center area. In the back center area, look closely at the knots in the body, just above the ring. 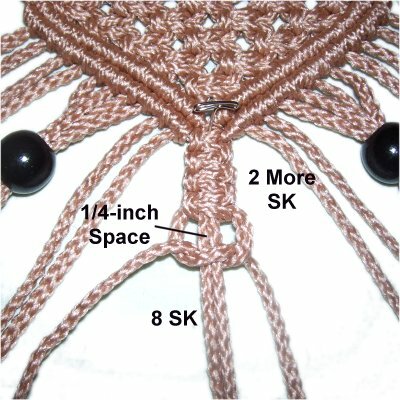 The knots in the pot should match those in the body, 2 rows above the row you are working on. Place pins to mark where they switch directions. Step 23: Starting in the front, tie LEFT ASK with the four cords in the center. They were the last cords you attached to the ring. Tie left ASK as you move left. Tie right ASK as you move right. In the back, make sure the last few knots match the ones in the body. 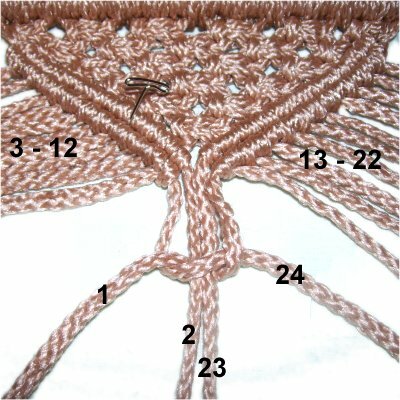 Step 24: Tie 11 more rows of ASK, working in a circle (total of 12 rows). In the final row, make sure the knots are as tight as possible. Step 25: Locate the FILLERS for each of the ASK in the last row. They should be the only cords attached to the next ring. Pass each one under (or through) the ring before you attach it. Attach each filler to the 3-inch ring with a DHH. Push the knots close together as you progress. There should be no gap between the ASK and the ring. The front of the DHH should be on the outside, which is the opposite of the first ring. Bring all the WORKING CORDS through the ring, and move the fillers off to the side. Step 26: Cut 1 cord, 36 inches long. Use it to make a 1.5-inch Wrapped Knot around all the working cords. After you tighten it, pull each working cord firmly. They should be straight and taut in the area above the Wrapped knot. Cut and finish off the ends of the cord used to make the Wrapped Knot. Step 27: You must first create the fringes at the bottom of the Owl Basket, so you have the scraps to make the eye feathers. The upper fringe that comes off the ring (fillers) should be at least 3 inches long. The lower fringe (working cords) should be at least 6 inches long. 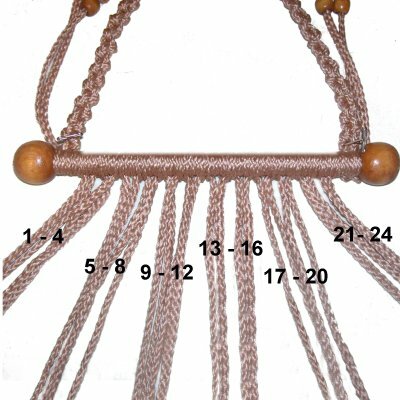 Beaded Fringe: Place one bead on each cord at the place you want it to rest. Tie a Barrel knot below it, and cut off the excess. For Bonnie Braid, melt the tip with a flame, so it adheres to the knot. Brushed Fringe: Cut the cords to the length you want the fringe. Unravel and brush each fiber and until smooth. Step 28: Cut the scraps into 6-inch pieces. 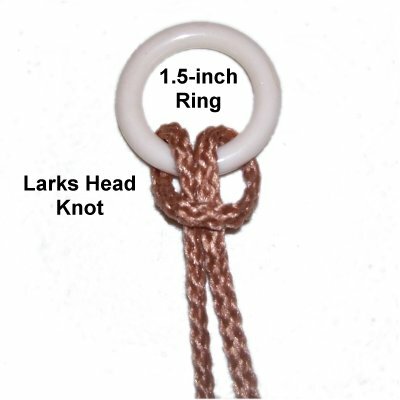 Attach 16 cords to a 1.5-inch ring with Larks Head knots. Push them close together as you progress, and tighten the knots firmly. Repeat for the second ring. Step 29 (Optional): To discourage the eye feathers from untying, apply glue to the cords in the back of the ring. Allow the glue to dry completely before moving on. Step 31: Unravel each cord, then brush every fiber to form the feathers. Cut each cord 3/4-inches from the Larks Head knot. Step 32: Complete the following step with each set of eye feathers, to decorate both the left and right eye of the Owl Basket. 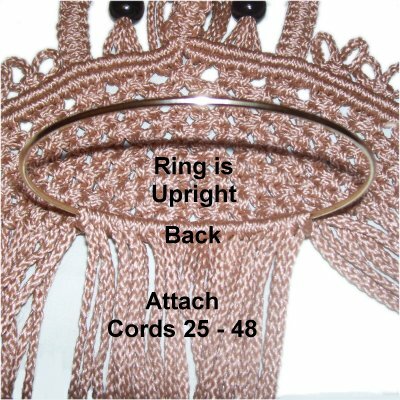 Place a piece of scrap cord around the ring between two Larks Head knots. Slide one end of it through a space between the two rows of DHH on the forehead (front to back). Bring the other end directly to the back of the face, passing under the DHH (not between). 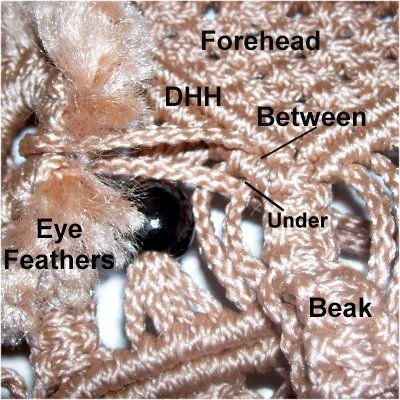 Make sure the eye feathers fit properly around the black eye beads. Tie a Barrel knot with the two ends of the cord, so it rests in the back of the Owl Basket. The ring needs to be secured on the opposite side, to the SK sennit. So place another scrap cord around it, squeezing it in between two Larks Head knots. Use tweezers to work one end of it through the SK sennit. The best place is between two knots. 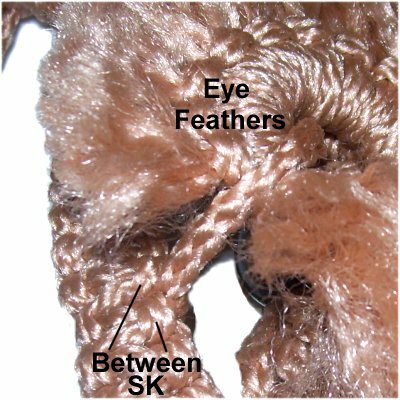 Make sure the eye feathers still fit properly, then tie the two ends together with a Barrel Knot, in the back. Finish off the cords used to attach the eyes. Melt the tips if using Bonnie Braid. The Owl Basket can now be hung from the ring at the top of the hanger. Some areas may rest flat against the wall, but don't expect all of it to do so, unless you secure it with nails or screws. Have any comments about the Owl Basket? Contact Me.